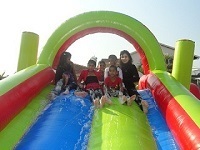 The Foam Slide Combo is great fun and suitable for children of all ages. It consists of the Foam Pit, machine to generate the foam, water hoses and electrical extensions. A reversible slide is also included for added fun. This means that the slide can be placed so that the children can climb out from the foam pit and slide down or the slide can be placed so that the children can climb up and slide into the foam pit. We deliver to your venue and set up as well as leave an operator there to operate the equipment and ensure that everything runs smoothly. Ground sheets will be placed under the pit to minimize mess. We will need a power point and a water tap. 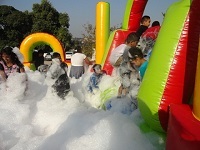 The Foam Slide Combo is about 5m wide and 6m long.